Wiley Rein LLP first opened its doors with 39 attorneys in 1983 as Wiley, Johnson & Rein. From the outset, named partners Richard E. Wiley, former Chairman of the Federal Communications Commission, and Bert W. Rein, former Deputy Assistant Secretary of State for Economic and Business Affairs, set the firm’s standard for excellence. The firm’s name has changed a few times since its early years—from Wiley & Rein in 1985, to Wiley Rein & Fielding in 1986 and Wiley Rein in 2007, when partner Fred Fielding left to serve as Counsel to President George W. Bush—but its founding mission has remained constant: to provide innovative, attentive, first-rate advocacy grounded in legal, regulatory, and public policy expertise and experience. Over the years, the firm greatly expanded, growing its diverse practice to include insurance law, government contracts, international trade, litigation, public policy, intellectual property, environmental safety, consumer products, corporate, election law, franchise, health care, privacy, cybersecurity, and unmanned aircraft systems. By the end of its first decade, the firm had more than 130 lawyers, and by 1995, Wiley Rein was home to more than 200 attorneys and consultants with specialties in more than a dozen practice areas. Today the firm boasts more than 240 attorneys practicing in almost two dozen areas of law, and has become one of the most influential and respected law firms in the nation’s capital. 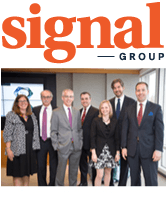 In 2014, Wiley Rein built upon its long track record of success and prominence in law and public policy by acquiring SIGNAL Group (formerly McBee Strategic Consulting, LLC) as a wholly owned subsidiary—creating a Washington, DC legal, advocacy, and communications powerhouse.